At one point in my childhood I became obsessed with bull fights. I had a good teacher, a man who lived at Finca Vigia in Cuba, a friend of my father’s, a man I called “the drunk American” because of the smell of his breath each time he held me on his lap while he and my dad visited. Hemingway loved the bullfight, and through his eyes, bullfighters became heroes to me. My grandmother was horrified. She forbid my watching bullfights on Cuban TV, and forbid my father from taking me to visit “Don Ernesto”. She explained to me the suffering of the bull, the harm that was being done to a creature of God for no reason. And eventually I was unable to watch a bullfight without my heart breaking at the plight of the poor defenseless bull. And then the first bomb exploded underneath my bedroom window. I slept through it, but woke to find my parents standing on the side of my bed telling me not to move. My hands were covered with some sort of black powder, and there was broken glass surrounding me from the explosion of the window above me. They removed the glass piece by piece and brushed the bed thoroughly before allowing me to get up. No one had been hurt, but something had changed. I was too young to understand the word “vulnerable”, but old enough to feel it. As time went on there were more bombs. There were bombs in movie theaters, shootouts on the street, two more bombs detonated, one on the porch and one by the gate in my grandmother’s house where I spent most of my time when my dad was imprisoned for daring to speak his mind on national TV. And my grandmother ran out of ways to protect me. Corpses became real. They didn’t get up and walk when the scene was over. Violence could happen anywhere and anytime. Terror became ordinary. So much so that when the time came that my cousins and I were old enough to go to the theater together my grandmother wasn’t concerned with what I would see on the screen or how it would affect me. Her admonition always was “make sure to check under your seat for bombs!” Just like that. Terror and violence became ordinary. And last night in Paris, terror reigned again. People left home to enjoy an evening. Girls went to hear their favorite band play, young couples held hands and kissed on the way to a bar, fans gathered at game. The darkness of terror like we learned to expect in Cuba, like they have learned to expect in Israel and Syria and too many other places to name, descended on the City of Light and made its people feel that vulnerability and helplessness that the innocent feel in the face of inconceivable evil. Other grand mothers who tried to keep their grandchildren living in innocence, will be telling them on the way to the theater to check under their seats for bombs. In a theater, in a restaurant, even in a church, people will maintain a degree of vigilance. It will be difficult to be carefree again. It will be difficult not to keep an eye out for danger. What is this germ of inhumanity that plagues us? Why does peace continue to evade us? Why can few children in our world finish their childhoods in innocence? As we face terror’s violent appearance once again, many will want vengeance. We know vengeance can bear no fruit that tastes like peace. If not that, what? Where do begin to make a difference? How? I have no answers. None. What I know is that reaction without reflection is no answer. That turning around and facing the enemy with a howl of vengeance, with blind rage, is not a good idea. The terrorists took a long time to get to the moment of carrying out their plan. It is right that we take some time to do the same. Time to grieve the dead, time to wrap our heads around the damage. We need time to come to grips with the new reality. Those who have already grabbed their guns and cocked them will not help us. They haven’t so far. Have they? Day by day in Paris and everywhere in the world there are souls that help us heal, souls that love, souls that speak truth, a truth without demagoguery. There are souls that show us the way of gentility, peace and forgiveness if only we are willing to listen. Don’t look for them preaching from pulpits of churches, where each congregation has its own version of God and of heaven and hell that they would have us believe. In churches that teach us difference instead of similarities, that teach us that God loves some more than others as if that were a concept even conceivable to Love. Don’t look for them in the halls of governments corrupted by greed for riches and fixed ideals that leave no wiggle room for freedom. Look inside yourself. Look to the grandmothers’ wisdom, look in the eyes of a child. Look at the stars, the beauty of the earth. Behold Love. Breathe Love. Give Love. Breathe Peace. Breathe them into yourself until they are such a part of you that even fear can no longer touch you. And then, after the healing, after you become That that you were meant to be, then and only then, take action. So that no children wake up to broken hearts, bullet holes and chards of glass. There is no time, you say? I say there is no time not to. I fear if we don’t find sanity and love, there will no longer be any grandmothers or grandchildren populating this earth. 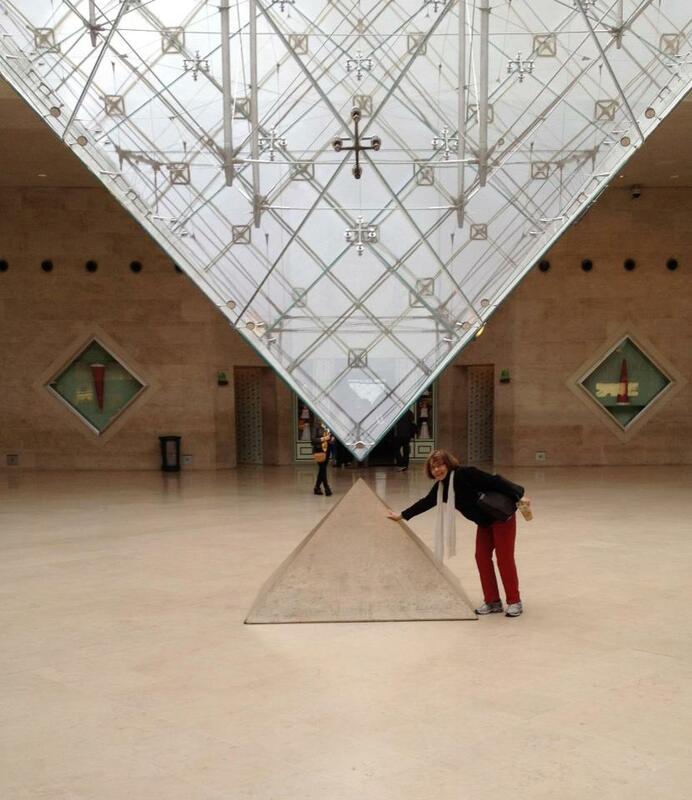 On a visit to Paris at Louvre. Next Post: REFUGEE, GO HOME! Very well expressed, thank you.